ADA: Americans with Disabilities Act. This is a civil rights law that outlines laws about allowing public access to disabled individuals with a Service Animal. 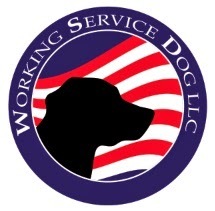 What are the Service Dog Laws for Businesses? Service Dogs are protected under the ADA. According to these service dog laws, no public establishment may deny a person and their service dog entry into their business. This applies to restaurants, shops and any other place where the general public is permitted. Businesses may not ask specifics about a disability but may ask if the animal is required because of a disability and what task the dog has been trained to perform. Businesses also may not ask for documentation about whether the animal is a certified, licensed or trained service animal. Although businesses may not charge an extra amount to accommodate the dog, they may charge for any damage done on the property by the dog. What are the Service Dog Laws for Owners? Service dogs must be under control at all times. This is usually achieved using a leash or harness, however in the case that the handler is unable to hold a leash due to a disability, the dog may be under voice control. If a service dog disrupts the public, the owner and the dog may be asked to leave the premises. This includes excessive barking, jumping or running around. If the dog poses a threat to people, such as by growling, you may also be asked to leave. This is a civil rights law amendment that extends ADA protection to disabled individuals with a Service Animal who are seeking housing in the public sector. Service dog laws also cover housing. According to the Fair Housing Act, a person with a disability may not be denied housing based on that disability. A landlord or homeowner's association must provide reasonable accommodations to people with a disability, which includes waiving a no-pets rule and deposit. The Air Carrier Access Act of 1986 states that air carriers may not discriminate against anyone with a disability. This includes allowing service animals to accompany their owners in the cabin on flights with no additional charge. These service dog laws help to protect everyone, from the person with a disability to the general public. If you have questions about service dog laws, check the ADA.